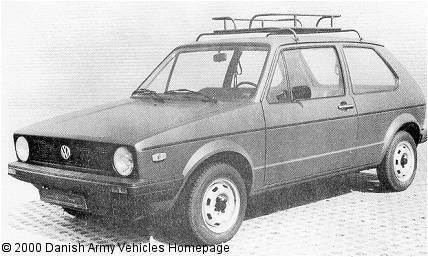 Danish Army Specific: The first VW Golf to be used in the Danish Army. Deliverance took place from January 1980. Historical: The Golf was introduced in 1974 to supersede the "Kâfer". Production of the A1 ceased in 1983 with some 6 million produced. Length: 3.81 m (148 inches). Width: 1.61 m (63 inches). Height: 1.59 m (62 inches). Weight: 1.250 kg (2.750 lb.). Engine: Own 4-cylinder, 1.471 cm3 (90 cubic inches), liquid-cooled. Horsepower: 50 at 5.000 rpm. Additional: In the early 1980´s the 1.471 cm3 engine was superseded by a longer-stroke 1.588 cm3 unit. Acquisition price was around 41.000,- DKr.